How might a wall become a collaborative musical instrument? How can device-based interactive art help you forget the technology and lose yourself in the art? An interactive sound art experience with Linn Meyers' site-specific drawings. Premiere: July, 2016 at Sound Scene in the Smithsonian’s Hirshhorn Museum of Art. An interactive audio performance that explores the personal and social perception of experience. Framing Device invites participants to wear viewing masks and choose their own aural pathways on wireless headphones to navigate the psychic and physical space of the art museum. The Silosphere imprints imagined landscapes onto a participant’s perception of real-time events. The piece explores ideas around the science of mediated experience, radiation, sonic projection, and electromagnetism. The Silosphere is a personal audio and visual experience designed for one participant, who wears the device like a diving bell. A camera mounted on top of the Silosphere transmits a live video feed to the wearer and is her only visual connection to the outside world. A written description of sounds in the room is projected onto a screen in view of the wearer. This visual representation of real-world sounds (which the wearer cannot hear) further subverts her interpretation of what is actually happening. 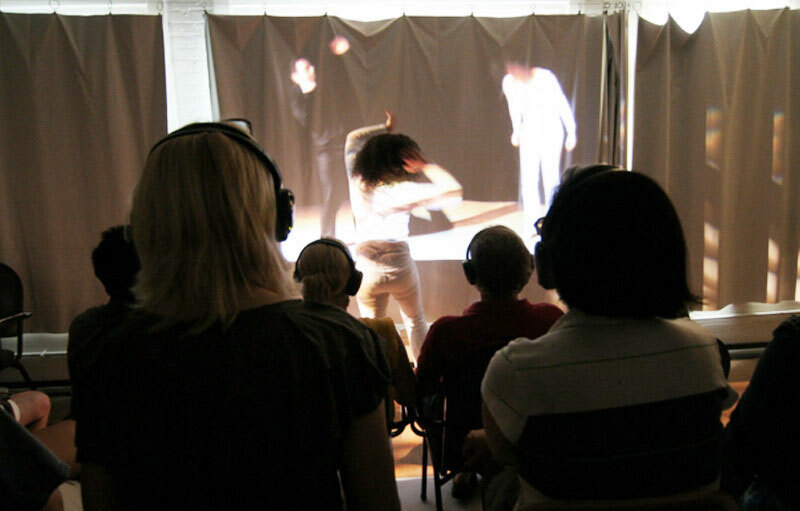 The “Would” performance unfolds as a four-screen video installation that an audience member enters into wearing wireless headphones. 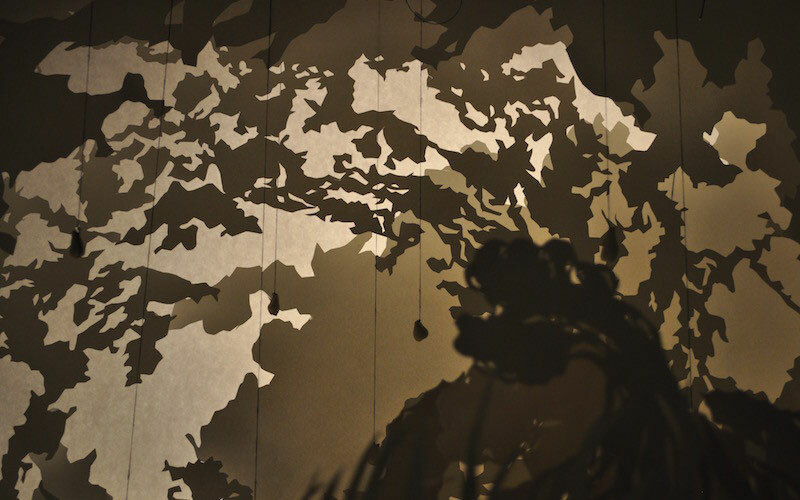 It tells the story of an imagined planet’s systems - the geosphere, hydrosphere, biosphere, and atmosphere - through abstracted forms and movement. The "Would" is a seamless, dynamic world through which the audience moves. Its intimate soundtrack synchs up with and departs from live sounds, guiding the audience through the piece. The work is not merely a flat screen to look at, but a dynamic setting which asks to be entered. Watch video documentation of the project here. Using raw data as a content generator, this collaborative work of dance, film, and sound was derived from a database created by the respondents of an online survey. Answers from a 12-question survey were used to form the underlying structure of a new, innovative, data-based performance work. Created by The Brayver Concern in collaboration SJ Ewing, one of Washington DC’s most exciting choreographers. Very short and very small dance films are presented on tiny screens in a darkened kiosk for an audience of one. The result is a uniquely personal, interactive experience for the viewer which evokes the nostalgia of an old-time penny arcade. The project evolved out of guerrilla performances choreographed, rehearsed, and filmed in Lower Manhattan's public spaces. Each film is done in one take and no artificial light is used during the shoot. This process of creation and exhibition encourages the filmmakers to concentrate on what they feel is useful in dance and on film: corporeal and mechanical magic. A collaboration between Brayver Concern member James Bigbee Garver and Choreographer Peter Kyle. FILTER explores the ideas and instances of filters and how people employ them. The audience wears wireless headphones and sits in a room with floor-to-ceiling windows, while the action of a play happens on the street below them. In your headphones you hear the nuance of pedestrians across the street while lush music envelops you. You take off your headphones and the room is silent. Multi-layered video images are projected onto windows, the ceiling, the audience. You are part of a shared voyeuristic experience. Your fellow audience members will each weave a different imaginary story from this immersive theater event. 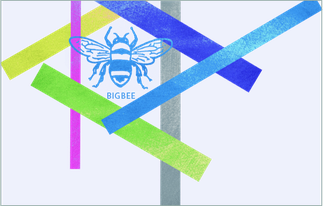 A collaboration between Brayver Concern member James Bigbee Garver, Sarah J. Ewing, and Kristy Simmons. Press: DC Theatre Scene, Dance Metro DC Award finalist. 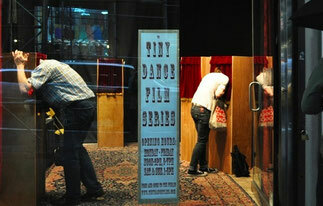 Installations, DIY kit, workshops, public performances. Drink.Pee.Drink.Pee.Drink.Pee looks at the very personal environmental issues caused by flushing our pee down the toilet: harmful algae blooms in aquatic ecosystems and pee-derived pharmaceuticals in our drinking water. 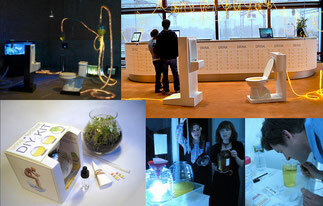 The artists conduct workshops/performances where participants are able to see their urine transformed into an immediately usable fertilizer to feed their own plants. A collaboration between Rebecca Bray and Britta Riley. Press: ArtNews, The Discovery Channel: Planet Green, PRI (Public Radio International), We Make Money Not Art and others. Bigbee Sound creates sonic inventions, soundscapes and music for live performance, interactive media, and film. Music and designs have been heard Off Broadway at Lincoln Center and in New York at the 92nd St. Y, Performance Space 122. Washington, DC credits include Folger Shakespeare Theatre, Signature Theatre, Woolly Mammoth, The Studio Theatre. Sound designs for museums include the American Museum of Natural History, the Smithsonian Institution’s National Museum of Natural History and National Museum of American History. Residencies and teaching artists positions include Robert Wilson’s Watermill Center, Georgetown University, Whitman College, HERE Arts Center, Abrons Arts Center. 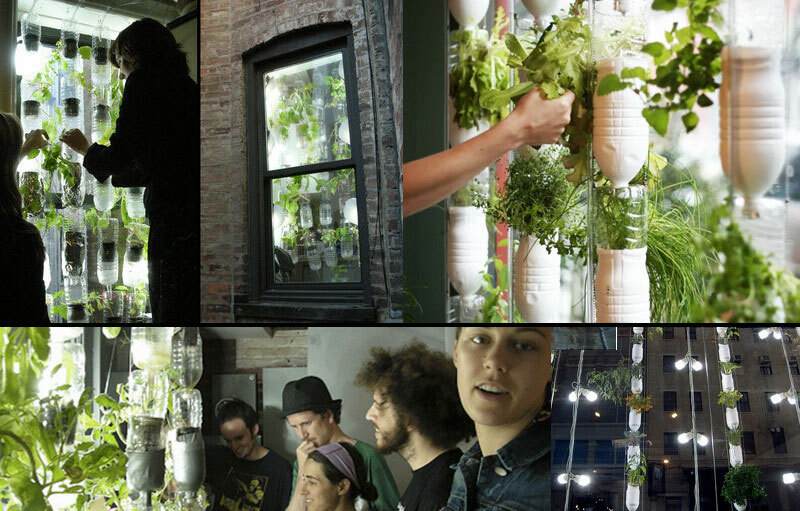 Windowfarms are suspended, hydroponic, modular, low-energy, high-yield light-augmented window farms built using low-impact local materials, created in collaboration with a vast network of online and local collaborators as an experiment in using collaborative design to solve environmental problems. Windowfarms was created by Rebecca Bray and Britta Riley during an artist residency at Eyebeam’s Center for Art and Technology in New York in 2009. Press: New York Times, Wired Magazine, Treehugger, Inhabitat, Gizmag, Grist Magazine, DesignBoom, Dorkbot and others. 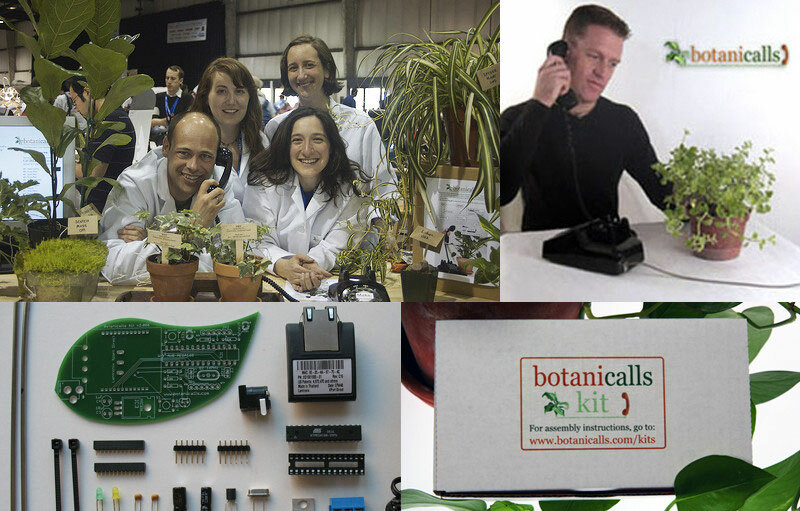 Botanicalls is a kit that allows plants to call and text people to ask for water, and extend thanks when they get enough. The project is fundamentally about new avenues of interaction between plants and people - plants that might otherwise be neglected are given the ability to communicate with their caregivers to request assistance. Botanicalls is a DIY kit for sale at AdaFruit and has taken the form of a walking tour of Manhattan. 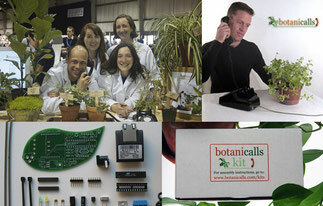 Botanicalls was created by Rebecca Bray, Kati London, Kate Hartman and Rob Faludi in 2007. Exhibitions: Museum of Modern Art (permanent collection), Conflux Festival (2008), Maker Faire SF (2007), New York University. Press: New York Times, NPR Morning Edition, Wired Magazine, BBC, Business Week, Make Magazine, Good Morning America, Gizmodo, Time Out New York, BuzzFeed and others.